A rather complete lightweight day pack from Mammut. 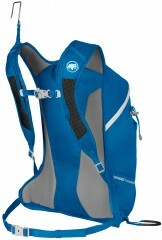 The Spindrift is an ultralight backpack for ski touring that has a number of race-inspired features. The ski attachment system can be operated without removing the pack, and the separate side compartment provides quick access for crampons, hydration, or a backup layer. 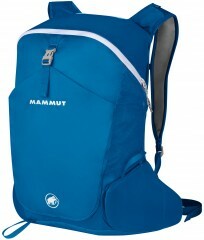 Mammut added a couple nice twists, such as removable back-padding that can be used as a moisture-blocking cushion. Also there is a zipper compression system that lets you shrink the pack for short days and enlarge it for longer ones, with or without rope. The Spindrift 25 is a solid ski touring pack that shows off Swiss attention to detail. External helmet and jacket holders let you carry more stuff internally. 100D Cordura® nylon is strong, and it goes up to 210D on the bottom. Ice pick holder doubles as a pole holder when using the axe or on rappel. Zipper expansion on the front of the pack allow it to transform in size. Speed ski attachment consists of a loop holster and a bungee hook. Small exterior zipper pocket is handy for hard-to-find items like skin wax. Back padding can be removed if you want to make a cushioned seat. Compatible with hydration systems with internal hangers and exit ports. is this a one axe pack? Hi Sather, this pack is designed to work with one axe. Depending on the axes, I think you could make two fit in a pinch, but it wouldn't be ideal. Hi. This is a similar question that i asked for a different pack. I would like to carry a small daypack that I can easily roll up or made compact to carry into a hut. I use a 70 liter pack to get to the hut and would like to find a pack that can carry all the necessary backcountry ski gear but yet light and compact enough to carry. Will this pack roll up or does it have a rigid frame? Thanks. Hi Allan, there is no spine in this pack so you could roll it up.